Yesterday was a busy day for Dwayne Johnson. Earlier in the day he went on Kelly and Michael to promote Hercules and revealed his Hercules beard was made of yak testicle hair and last night he appeared on The Tonight Show. When Fallon asked how he got in shape for the role Johnson told him he had found an old VHS tape of fitness duo “The Fungo Brothers.” The kind of fitness tape with cheesy graphics that you&apos;d be shown in your P.E. class. 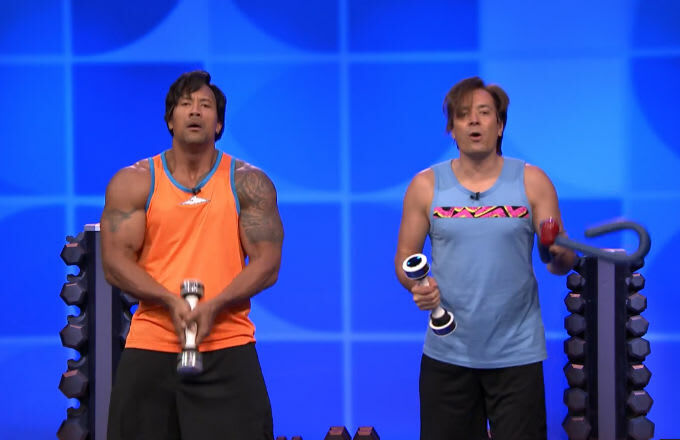 Cut to the “tape” of Fallon and Johnson as fitness bros ahead of their time working out with “revolutionary” (and sexually suggestive) tools like the thigh master and the shake weight jack weight.